Anyone who has ever flown in a ‘plane knows that landing can be agony if you have a cold with a stuffed up nose and blocked ears. As the ‘plane comes down, particularly if it is a short-haul flight that requires a fairly rapid descent, the ear drums sometimes feel that they are liable to explode. Pain in the ears during flying is one of the reasons that parents curtail their trips abroad when they have young children. In infants and toddlers, ear pain due to flying tends to cause a lot of inconsolable screaming. Why Does Flying Cause Ear Pain? The answer is all to do with pressure. Not psychological pressure, but physical pressure relative to the ear drum. An aeroplane cabin is pressurised – this means that the pressure inside is maintained even though the pressure outside the plane falls dramatically as it gains altitude. The ear has its own way of sensing air pressure and the air pressure in the ear canal is not always the same as inside the middle and inner ear. When you fly in a plane, there is a difference between the pressure of air in the cabin of the aircraft and the air inside the ear drum. This difference is normally equalised fairly rapidly by air passing in our out of the middle ear through the Eustachian tube, a tiny tube that connects the middle ear with the top of the throat. When a plane takes off, the pressure in the cabin of the aircraft starts to fall. The ear can cope quite well with this, even in someone who has mucus in the Eustachian tube because they have a cold. The reason for this is that the air inside the ear drum is at a higher pressure than the air outside, so this extra pressure just forces more air to leave the inner ear through the Eustachian tube, which you don’t really notice. The problems really begin when the plane lands as this reverses the situation. As the plane descends, the air pressure inside the ear becomes lower than the air pressure in the cabin – the solution is for air to enter the middle ear through the Eustachian tube but this doesn’t happen so easily. The lower pressure inside the ear causes the ear drum to be forced inwards, pulled by the difference in pressure and this can be both painful and can lead to hearing loss, usually temporarily, although the effects can last several hours. If you set off on the plane journey and your hearing is already impaired, this effect can be much worse and you can actually become unable to hear. The changes in pressure and the movement of the ear drum, together with the constant buzzing noise of the plane engines can also have an effect on people with tinnitus. Some people find that the background noise makes their tinnitus disappear during the flight but then their tinnitus experience can become intensified once the plane lands. If you have a young child who has glue ear, taking them on a plane flight if they are still having treatment but have not yet had grommets could be a problem. You need to check this with your doctor well before you commit to the journey. 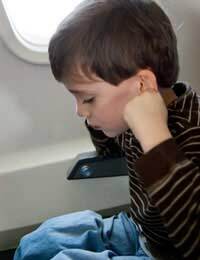 Children with glue ear have a blocked Eustachian tube, so the pressure changes during a flight could cause them extreme pain. If your child already has grommets, these equalise the pressure changes between the inner ear and the outside world very rapidly. A child with grommets will have no problem with a plane flight.